Family housing for service members in Wisconsin and South Korea, schools on military bases in Germany, and upgrades to Fort Bragg in North Carolina and Air Force bases in Alaska could be on the chopping block with President Donald Trump's national emergency declaration to use billions in military construction money to build a border wall. 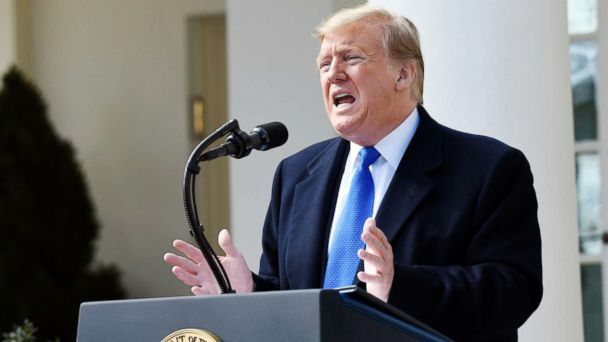 The president declared a national emergency from the White House Rose Garden Friday after signing the declaration, a move administration officials argued would free up funds appropriated by Congress for military construction to help build the wall, and allow Trump to deliver on his campaign pledge after congressional Democrats repeatedly rejected his demands. Under the terms of the declaration, the administration would have access to $3.5 billion from the Pentagon's military construction budget, along with $2.5 billion from the Pentagon's drug interdiction program and $600 million from the Treasury Department's drug forfeiture fund. Funding dedicated to military housing construction, however, will not be diverted to the border, a Pentagon spokesman said. "Military family housing will not be affected," the spokesman, Capt. Bill Speaks, said. The $3.5 billion in military construction funds could be taken from a wide range of projects, including landing pads and maintenance facilities for the new F-35 fighter jet in California; waste management facilities at Guantanamo Bay; a high school for military children in Japan; and special operations forces training facilities in North Carolina, according to a list of projects provided to ABC News by a congressional aide. When asked whether the decision could harm morale in the military and among military families, Trump claimed Friday that military officials told him they felt the border wall was more important than the projects that could be canceled or delayed. "Some of them haven't been allocated yet and some of the generals think that this is more important. I was speaking to a couple of them. They think this is far more important than what they were going to use it for. I said: 'What were you going to use it for?' and I won't go into details, but didn't sound too important to me," Trump said. A senior administration official said lower priority military construction projects, such as repairs that could wait until next year, would be targeted. The official insisted nothing that impacts lethality or readiness would be impacted. While it's still unclear exactly which projects will be targeted, some projects on the list of vulnerable projects include special operations forces training centers and operations facilities for Navy SEAL training. Delay of construction of these types of projects could directly affect readiness, ABC News contributor Col. Steve Ganyard, a former Marine Corps pilot, said. "While some things can afford to slide a year, there are construction plans that go for 10 years. Any time you disrupt long term planning budgets, it has second or third order effects. It's not as simple as sliding everything one year. It could disrupt a lot of things," Ganyard said. And experts also warn about the potential consequences of reallocating $2.5 billion from the Pentagon's drug interdiction program. Those funds are usually used to fund federal, state, and local law enforcement investigations into drug traffickers and violent gangs, according to ABC News Contributor John Cohen, a former Department of Homeland Security Under Secretary. "The Department of Defense interdiction monies are used to pay for intelligence-gathering, are used to fly airplanes and to support ships that are in the ocean that are actually interdicting loads of drugs en route United States," Cohen told ABC News' Devin Dwyer. "In a sense, we're taking money from effective operational programs and putting them to support a wall which will have at best a marginal impact on drugs flying into the country," Cohen said. The plan is also being met with resistance even from Republican senators on Capitol Hill. On Tuesday, Senate Armed Services Committee Chairman Sen. James Risch said: "If it has to be that way ... leave MilCon alone."